The Kombucha Mamma Continuous Brewing No Frills System w/ Modern Porcelain Crock is the package for those who just need the basics covered. Our high quality supplies coupled with your locally sourced sugar will yield a tasty brew! Custom Made Brewer Cap w/ Gripper Elastic (KKAMP EXCLUSIVE!) - Choose from a variety colors. Upgrade to Brewer Tee Set for insulation and style! Ferment Friend w/Thermostat (KKAMP EXCLUSIVE!) - $150 Value - SAVE BIG $40 OFF! - Just $120!! I love my continuous brewer! The instructions were SO spot on and easy to understand and I am already on my third batch. I love this method and the brewer. So much more fun and easy than I could have expected! Thank you!! The continuous brew is a dream. Easy to use, looks great on my kitchen counter. Enclosed was a beautiful, healthy SCOBY. I didn’t purchase the heating system, that was a mistake. A week later I order the heating system with dimmer, it’s great. Just set and forget about it. I bought the No Frills Porcelein CB package and I have never made a purchase that has so exceeded my expectations as this one!! 5 Stars for sure!! I am brewing two gallons a week and can't keep enough for myself!! Turned my neighbor on to this stuff and now she's hooked. Bringing Kombucha to relatives in Orlando. Recommending your product to everyone who enjoys my brew. I used to make Kombucha up North with my brother the old fashioned way and eventually lost interest. With the CB system it is ridiculously easy to make delicious Kombucha that everyone says is better than anything that they ever bought in the store!! Each bottle can be a new flavor adventure. One of the things I stress to people who may be interested in the CB system is that the Support Services provided are phenomenal!! Between the videos and the Kombucha Bible (a must have item) you become an expert the minute you open the box!! I used to drink a six pack of diet cola per week. Haven't touched the stuff in several months since I switched to Kombucha. Went on line to investigate making it myself again and discovered Kombucha Momma - and the rest is history!! Sorry for all the exclamation marks!!!!! I was a little skeptical that the continuous brewer would be as easy as described -- however; we could not have been more thrilled. The continuous brewing system, is as advertised, simple to use and contains everything you need. Could not be more happy!! My Kombucha journey started with a cousin raving about this elixir and securing a Kombucha sale at the grocery store. A few days later, I saw GTS and other booch brands at TJ’s and tried my first cold bottle of gingerade. It was love at first SIP! The $3-5/ 16 oz bottle of commercially produced Kombucha was digging a hole in my wallet. I was starting to read and think about making fermented sweet tea at home but how do we embark on this journey without the knowledge and tools. Browsing through Kombucha kits, vessels and Scoby on Amazon, I stumbled on Hannah’s book and spent the next few hours reading through the effort involved in batch brew vs CB, calculated the ROI and decided to move ahead with a CB system. The product was shipped on time, the quality is very good, and instructions are clear and concise. I ordered myself a no frill, modern porcelain CB system and heat strip to keep these babies warm. I live in NY and my house is always cold. To keep the brew at 78-80, I connected the heat strip to a digital timer that turns ON for 30 minutes and OFF for 1 hour and wrap the thing with a warm scarf. This keeps my brew at a stable temperature without manual intervention. I have decanted 5 bottles of mature Kombucha and tastes way better than store brought. We have been extremely happy with this continuous brewing kit! The original wooden stand that was delivered was defective and Kombucha Kamp replaced it incredibly quickly. If I were doing this again, I would get the heat wrap add-on at the discounted package price. It is a necessity in the NE. We had a hard time finding one elsewhere that actually fits the brewer and ultimately didn't save much $. I'm on my 2nd batch of kombucha using my new continuous brewer. This is by far the easiest way to make kombucha, and also the quickest I believe. The brewer looks great on my counter and was very easy to set up and start using, thanks to the great video instructions that come with it. So glad I found kombucha kamp and kombucha mama! I love having a continuous flow of buch in my house. 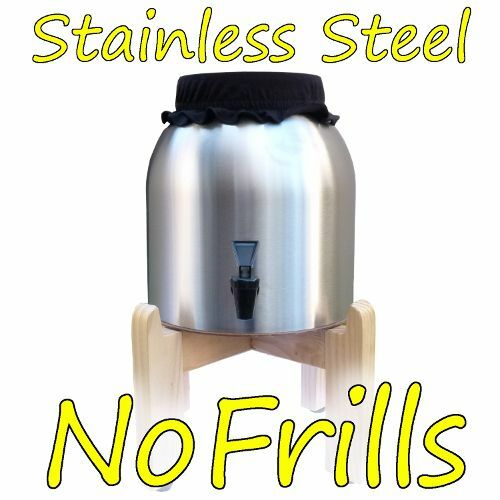 I bought the No Frills continues brewing package. So far it’s been working very well. Despite being new to making kombucha it was easy for me to follow the instructions on how to set everything up. It’s a great product and great company. Everything arrived packaged very nicely and it is a much better package than I could have pieced together on my own! I will likely end up ordering another here at some point! I received the Big Book of Kombucha for Christmas, so I did not purchase that this time around, but it has definitely come in handy and it has been a very valuable tool! I am also very impressed with the little cap that came with it. I have actually found fruit flies hanging out on it (after a forgotten avocado attracted them all) and none were able to get in! I've purchased products on this site for myself and others and would not hesitate to recommend any of them! The system arrived safe and sound and very timely. The videos that come with the package are helpful. The Kombucha Book is SO amazing and a must have for everyone brewing. 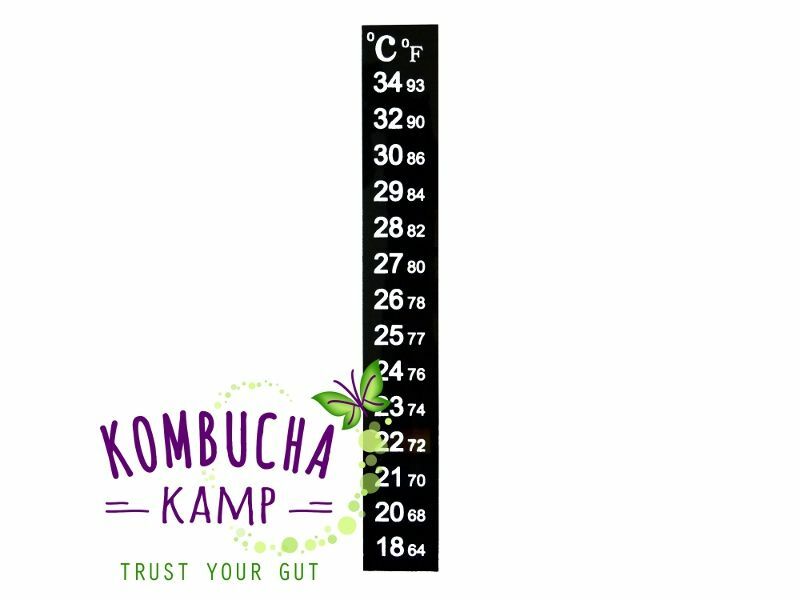 Details are so on point and it is clear that Kombucha Kamp has extensive experience with the process which is reassuring. The TASTE is amazing. I don't know if it is the tea or the organic cane sugar I switched to, nonetheless, very pleased. Thank you. I received the Kombucha book for Christmas and started reading right away. I knew if I was ever going to make kombucha, it would have to be as easy and mess-free as possible. So I purchased this kit and couldn't wait to receive it! It probably took under two hours to review the instructions, put the stand together, clean the vessel, brew the tea, etc. But it was a lot of fun to do and the time flew by! The SCOBY's that came with it were so healthy and I have already decanted several bottles that I added chopped dried cranberries to for flavoring. I love seeing the SCOBY grow and recreate itself and tasting it each day to see how it changes. A fun, healthy biology experiment every day! And I love the personalized note on each invoice....very happy to support such a wonderful family company! I've been a Kombucha drinker for years purchasing it from my farmers market. I have just started drinking my first batch of continuous brew and it is delicious. The customer service of Kombucha Kamp is outstanding. I am a very happy customer. I guess I'll add my own five-star rating to this product, too! I originally ordered the beginner kit to brew individual batches, as I thought that might be an easier way to start brewing. After I slept on it, though, I changed my mind and decided to do the continuous brewing. Because Kombucha Kamp is so prompt, they had already shipped my original order that afternoon. I asked about my upgrade options, and by the next day, they had shipped me the additional items to make my single-batch kit a continuous brewing system. I got it started up on a Sunday a little over a month ago now, and I have been SO TOTALLY PLEASED with not only the delicious finished product, but also with customer support and quality. I'm saving a ton of money on store bought, my husband thinks I'm some sort of magical 'booch brewing genius, and the flavor that we're getting by brewing our own (we like ours super tangy and vinegary) is second to none. I also purchased the basic heating strip to keep it warm during the winter and threw a t-shirt over it to hold the heat in. Superb. I fully recommend this product! After making several one gallon batches of booch, we decided on a continuous brew kit. 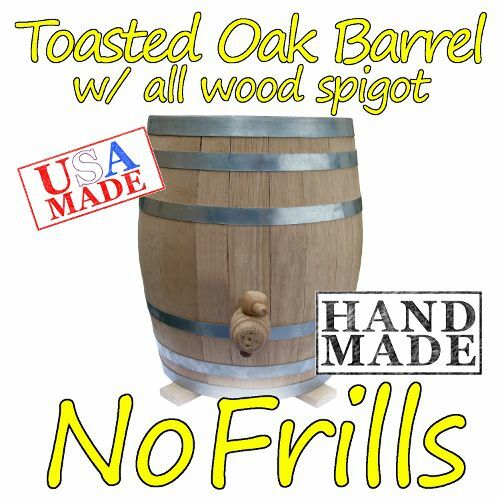 Going for the "no frills" model we've been nothing but happy. The two scoby's that came with the kit did the job in about a week. We then added a heating kit and have been making some of the best booch yet. Good investment!. It took me awhile to order because I kept going back and forth between the continuous brew kit and ordering only the supplies needed to make individual batches in gallon jars. I decided on the no-frills continuous brew package as I figured it would be easier to manage in the long run. I'm so pleased I went this route. I've bottled three times and each brew gets easier and easier to figure out. I have to admit I was a bit nervous starting this process but now am getting more comfortable and confident. Hannah, you make it so easy by including the videos and printable instructions. So far I've made ginger lemon only but the next pouring I'm going to branch out on flavorings and see if I can get a little more carbonation going. I'm having so much fun with this! Thank you! Since my purchase of the CB I am in heaven. Shipping is fast from Hannah, equipment and supplies are always of the finest quality. I will never go any other way other than continuous brew. Thank you KKamp for always delivering the goods !!!!! The brew package was great! It came with everything I needed and I'm already hooked. I've already started planning on my next set! Great product! I'll keep coming back for all my other goodies! This is my first experience with making kombucha and I am very pleased with the kit. I added the heating system with thermostat since my home is drafty in the winter, and it has really helped to speed along the process. Since everything was included, set up was easy, and Hannah's videos and online manual give you all the info you need to get started. The SCOBY was really healthy looking! I had a few questions about my second ferment and my emails were answered promptly. I am liking the setup so much that I now have a second continuous system going. I will definitely continue to do business with Kombucha Kamp. Thanks, Hannah! I'm very pleased with my continuous brewing system. It was a bit intimidating at first however the included instructions, the videos,phone and e mail support have been wonderful. If you are on the fence -continuous brew and this company are the way to go! Customer service is beyond compare! I'm loving my Kombucha Camp purchase! After starting to get into Kombucha last year, and discovering I was drinking it (and spending money on it!) every day, I decided to try brewing my own. I certainly felt a little nervous about it, and didn't want to waste time or money on an unsuccessful brew. From the start Hannah was accessible to answer questions and her videos and written guide provided everything I needed to get started brewing successfully. I ordered the continuous brewing vessel and starter kit, and in just 2 weeks had my first yummy batch ready! Thank you so much to Hannah and the Kombucha Kamp team for introducing me to the art of brewing Kombucha! I am so pleased with the continuous brew setup that I got from Kombucha Kamp. It has made the process of making KT much easier. I purchased the simple white porcelain brewer with a wooden stand as well as the t-shirt and cap to cover it. What I especially like about the t-shirt is that it keeps my heater wrap concealed and the whole unit looks nice and clean and tidy. I haven't been disappointed in her package deal and you won't be either. I'm really enjoying my continuous brewing system. It is so easy and very affordable compared to buying store bought brands for a family! And where we usually purchased various flavors from the store we all LOVE Hannahs Special Blend tea just as it is without the need to do a second ferment. I used to do water kefir but find the continuous brew so much easier than processing a batch in a jar. Thank you for such a great product. Continuous brew is easy and I feel so supported by your site and by my friends who introduced me to Kombucha. Order and delivery were easy and fast. I'm delighted! I am so pleased with the awesome service and quality of product. I was astonished how quickly my package of the missing SCOBY came and was so excited for my free gift! I would give you a 5/5 star rating any day! Thanks again! Love my continuous brew system.I've just barely gotten started but I'm looking forward to my own kombucha going on forever. Can't wait to try all the different flavors, although I really like plain kombucha with Hannah's brew mix. This system is working out perfectly--everything needed was included, if I had tried to put together all the components on my own, it would have been like every home improvement project I undertake--many trips to the store (or the internet) to try to get everything I need. Everything was already there, and was juuust right--the tea was excellent, the fabric cover stays on and does its job, the vessel looks nice, the spigot doesn't leak--I'm on my third batch, this is paying for itself probably within 3 months, now that I'm not buying bottles at the health food store every other day. The continuous brew kit arrived in great shape and was easy to set up. I was able to decant off about 8 bottles in 3 weeks (it just wasn't warm enough to go any faster). I added sliced ginger and a half teaspoon lemon juice and it was (and is) great. The SCOBY looks good and I am on my second batch now. thanks for all your information and support. so glad I did my research and came here to make my purchase! this system has been easy and tasty and I love my brew! I'm sure I've already made up the cost from all the KT I haven't had to BUY - I get to enjoy my own fresh! I LOVE this system!!!!!!!! It wasnt really hard to set up and the Instructions were Great!!!!!!! I got the heater with the dimmer Loved it so much ordered 2 more!!!!!!!! Thank You Hannah!!!!!! KK is THE BEST in my Book!!!!!! I began the continuous brew process about one year ago. It's been an educational journey! 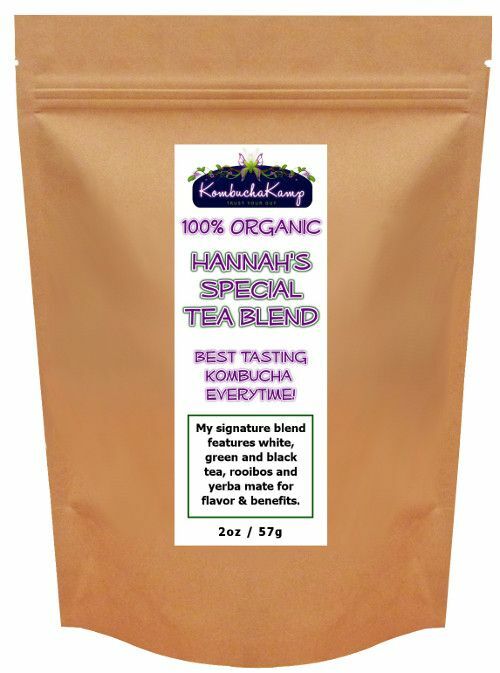 I recently purchased Hannah's teas and flavorings which have made by far, hands down, the best brew yet! Thank you. I have been very pleased with the service and attention I've received when I purchased my continuous brewing kit. It was very easy to get started and am enjoying my Kombucha tea. I was a little tentative when I first read about doing it myself, but the videos and other information provided by Kombucha Kamp made the process seem as simple as it is. I just decided to jump in and try the continuous brew system. I love the Kombucha and have made a believer out of my husband, too! I am so pleased I converted from brewing in gallon jars to using the continuous brew method with the Modern Porcelain container. Adding the heating coils to the container, and the cover, just made it that much better for my climate. My Mother Scoby is happily brewing continuously without my disturbance each time I remove brew and add more sweet tea. It makes it so easy and convenient. I love it! Love my new continuous brew vessel! I ordered one after a disaster ending up with Kombucha and vessel on the floor in pieces. Hannah was so helpful on the phone since I didn't need a whole new kit. She sent what I needed, gave me a great price and shipped to me quickly so I could get started recovering my brew! Such a pleasure ordering from this site! Quality products and excellent service!! Thanks Hannah! I had never even tasted Kombucha when I ordered this package, but I was convinced it was what we needed. The setup was easy, and three weeks later, we have had zero problems with the whole process. I love the taste, my husband and kids love the taste, and yes, I am noticing gradual improvement to our health. I am loving all of it! Love the continuous brew method. So easy and quick. I have a batch brew going as well. Between the two methods, we have enough booch for us and some to share. Passing on my first SCOBY to my sister in law in about a week. One thing that has impressed me more than the products, is Hanna's knowledge and willingness to help. She has been dead on with accurate info which is what caused me to order from her in the first place. I had a dehydrated SCOBY given to me by a friend, which I patiently rehydrated over a month. Then waited for another three weeks for my first batch. It was a decent brew but after that, I never got another batch from it that was acceptable. I came upon Hanna's site and read her comments about dehydrated SCOBY cultures, and it was as if she had been observing my experience and writing about it. After ordering the real deal from Hanna, I have not missed a step. We love our brew and the products we have bought from Hanna . She is my go to for Kombucha products and info. I am brand new to making Kombucha and came across KombuchaKamp. I am very, very pleased. I ordered the Continuous Brewer package. It arrived quickly. It was packaged very well and everything was in perfect condition. Way to go, Kombucha Mamma! We brewed our first batch and it was fantastic. It was so much better than the store bought stuff. Great product, great website, great service. What more can you ask for? Highly recommended! I also love the heater strip that surrounds my continuous brew crock. Living in Southern Cal by the beach, it can be tricky to brew in the cooler months but with the strip I brew fearlessly! Our KT is so delicious and I have even been able to create a wonderful Ginger KT using ground ginger and white sugar. I like it more than GT Dave\'s Gingeraid. Hannah, we thank you for your wonderful kit. The videos made it so easy. We just finished our first cleaning of the vessel about 3 weeks ago and after a 5 day wait, we are back to pulling about a gallon every 3 days. It didn't take long for me to realize I would not be able to afford my new found love of kombucha buying all those bottles at the store. My friend who introduced me to kombucha brews her own and so I began my hunt to find a SCOBY to try my hand at it. When I found KombuchaKamp, I began reading about the brewers. The simplicity of the process as well as the quantity of booch that the continuous brewer puts out interested me greatly. The deciding factor was that my husband did not want to see the SCOBY doing it's thing on the counter all week. So I ordered this package. I watched the videos and read through the online manual prior to everything arriving. The brewer, supplies and SCOBYs all arrived the same afternoon. I was able to set things up, cure the vessel, and make my first batch of tea feeling confident with all the information I had recently taken in. Living in FL, I opted not to get the warmer so it took about 2 weeks before I bottled up my first batch. I made some new tea and just poured it on top of my now beautiful big SCOBY. My first batch is still a little sweet for my taste but I know that as my SCOBY gets bigger, my fermentation time will shorten and I will be able to get that sour booch I'm looking for. Overall, I'm very pleased with my decision to buy this package and brew kombucha for myself and now my family. This system is so easy from set up to accessing the booch and starting the next batch! 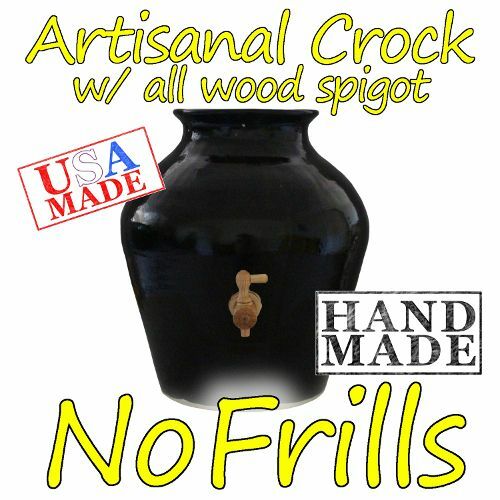 No funnels, transferring SCOBY's, cleaning out giant glass jars, etc. I love it! I now have three CBs from Hannah and I just love them. My husband and I drink 1-2 bottles a day. It has been helping his arthritic knee and it is helpful for my IBS and general health. Hannah makes it so easy to be successful. I like our KT much better than the store brands. I have watched all of Hannah's videos multiple times and joined the forum on the KommUnity. I love her CBs - the spigots are high quality and function so well and I couldn't live without her heaters. I have two to wrap around my three CBs. The t-covers make them look neat and stylish~ Love you Hannah!! I really like my brewing system. It is much easier than brewing batches! I bought that heater and it has worked out great to keep my tea at the optimum temp. Thank you! I got my Kit and love it. I already made a batch and it's great. I love the handbook that comes with it. It is full of great info. So excited to reap the benefits of Kombucha! LOVE the Continuous Brewer. Hannah walked me through the steps of what I needed to order to upgrade to a continuous brewer. Directions made the set up so easy. Very happy that I upgraded to CB. The support provided by Kombucha Kamp is outstanding. Would recommend Kombucha Kamp to everyone! Love Love my CBer. So simple to set up. Wonderful Directions and Videos. The best purchase. Thanks again KKamp and by the way...it makes the best KT. 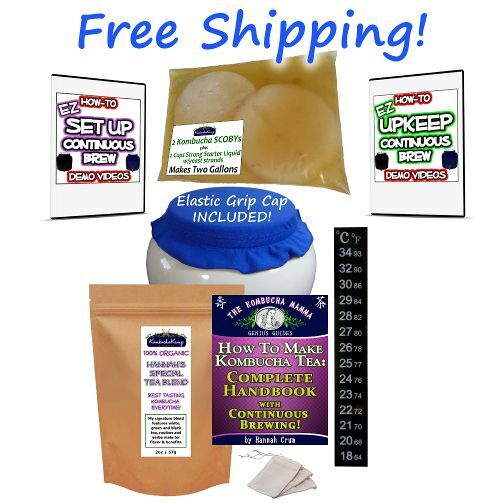 I am so glad I got my Continuous Brewer kit from Kombucha Kamp! Two big, beautiful SCOBYs came in the package, a bad of tea, brewer cap, brewer & stand, full instructions online and a wealth of information and support both at the KK site, in Facebook and at Kombucha KommUnity! It is much easier to use CB, less chance of mould, contamination and damage to the SCOBY and brew, not to mention that faster turnaround time due to only filling at 75% full of KT. I love KK CB so much, I promptly ordered a beautiful Artisan Crock, which I await anxiously to arrive to supplement the growing love for kombucha in my household. Thank you Hannah and Kombucha Kamp! Hannah promises a complete and successful kombucha system, and she delivers. Over the years I've learned it's good to follow the instructions of others who've done the hard work of learning how to do odd things. I followed Hannah's, and ten days later I had a working batch. I've done 6 continuous brew cycles with this kit and her guide, and not had a single problem. It's been a pain-free, taste-rich process. I would recommend this crock to anyone who makes Kombucha...IT IS AWESOME and easy to bottle the product once done. That is the main reason I got this package. ALSO, her blended tea to use in making the tea is terrific! So! :) I got the bug. And I thought to myself - gee. . . I really like this stuff, but it -is- a tonic, so maybe I wont drink it every day? And gee- if I'm not going to drink it every day I don't really know quite how much I want to brew because I could easily make way too much... Mmmmaybe I should brew in a jar? But instead I read all the fantastic reviews with this system and ponied up, instead. And I just want to say its Great! REALLY GOOD DECISION :) Solid, easy to use, beautiful system - super clear instructions... :) And if I don't feel like brewing a ton, I can just leave it alone and let it become stronger - only to dilute it later and let it do its thing. Super cool!!! Very easy. Very happy. Co-Existsance. I am so glad I invested in this brewing system. About one month later, I've brewed $150 worth of delicious homebrew (based on $4/bottle from the store!) and am loving having a constant supply. All the educational materials and the facebook community support make brewing stress-free. Go for it! We've been brewing for a little over a month now and it's SO effortless! Setting up the continuous brew system was incredibly easy and now every few days we have wonderful fresh kombucha. I had tried to brew last year and got a free SCOBY that got moldy and was a bit discouraging. My SCOBY from Kombucha Kamp is growing so well, no weekly cleaning, and is giving us yummy drinks. My husband no longer asks for soda, and I am able to give him unflavored while making all kinds of creations for myself. I also recommend the heating system to keep it in the appropriate temperature range. We've used it quite often during the winter and noticed no change in our electric bill. Love it! The product is perfect and the response time of To my questions and ultimately my order was super fast. Kombucha Kamp makes it super easy and the tea blend that came with it is amazing (of which I'll be ordering more soon). I'm recommending Kombucha Kamp to all of my friends. We are just getting our first taste of the Kombucha from our new continuous brewer. It is so much easier and faster than a jar. We got the Heating System with Dimmer, also. Such a help! In fact, I ordered a second one for the Kombucha I am making in other vessels. expensive habit. I found Kombucha Kamp online and read all about the continuous-brew method, which seemed like the easiest way to make kombucha at home. I convinced my husband we needed one! 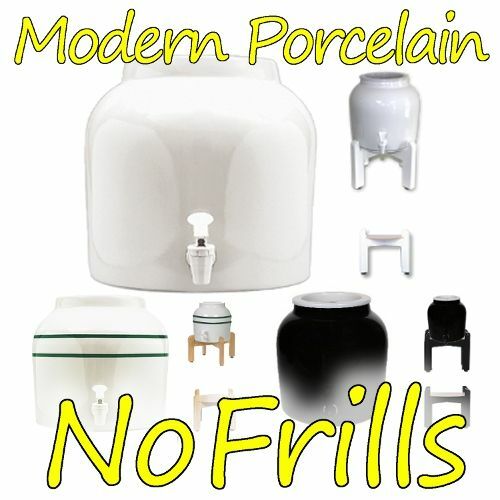 The No-Frills kit arrived within days of ordering. It was so easy to set up thanks to the instructional videos Hannah makes available when you order. The "How to Make Kombucha" handbook is full of information for anyone interested in the history and how-to of making kombucha. We are making delicious kombucha now and it is so easy. The Heating System with Dimmer is a tremendous help to keep the temperature just right. Here in NY it would be hard to keep the brew warm enough. Thank you so much Hannah Crum! I got the no frills continuous brew package. I've been brewing ad enjoying KT now for about a month. I'm finding brewing much easier than working out of gallon jars. Customer support has been great. I had tried to make kombucha from a store bought bottle. It worked but wasn't really good. I ordered the 'no frills' package. It came promptly, had clear directions, and was easy to assemble. After just a week and a half I had kombucha that was delicious. I love this product. I am very happy the the performance of the continuous brewing system. Thank you. I had my first "taste" of my KT this morning and it is delicious! I have left my SCOBY undisturbed as you suggested and it is HUGE! I have a continuous brew vessel, and the SCOBY fills the entire top and looks quite deep and it is beautiful, white, creamy, translucent. The perfect SCOBY. I hand'nt filled my CB'er with enough tea initially, so I drained off 8 oz and made a BIG batch of sweet tea to fill the vessel. I can't wait to have lots of tea and experiment with flavorings, but WOW! This is soooo much better than anything I have ever purchased at the store. THANK YOU SO MUCH for offering your products and giving tons of advice to newbies like my self. I am amazed at how generous you are with your knowledge. I hope to be a lifelong brewer of 'booch! I am very satisfied with the fast service and the products I received. I first bought a scoby and then the Continues Brewing System. I have made the tea and it turned out well. Now my Brewing System is up and waiting. The instructions have been clear and personal service has been very helpful.Thanks. I already had cultures but I figured I'd try the ones with this deal and they were better than the ones I had on hand. The kombucha was stronger and more flavorful. Kind of hard to describe. I agree with the other reviewers that it was easy to make and easy to follow the instructions. Even to Canada the shipping was reasonable and it came pretty fast considering. 5 stars. I have been wanting to make kombucha for a long time but was apprehensive until I found your website. Your daily email course got me excited to begin making kombucha and I ordered from you not long after. I began the continuous brew method a little over a month ago and I am already (joyfully) reaping the benefits Having kombucha on tap and being able to share it with friends, family and coworkers is a true gift. I am absolutely smitten by the Continuous Brewing. This method is, in my opinion, the best thing to happen to my kombucha brewing. I spend 5 minutes once a week and have a constant supply of fabulous boocha. Easy, no mess, no worries. I am so happy that I ordered the Continuous Brew kit from Hannah. The dispenser is just as Hannah describes it...easy. I love not having jars sitting in my pantry and refrigerator. When I want a glass of kombucha I just turn on the spigot! And not having to prepare a new scoby every few days is in itself worth the dispenser. LOVE IT!! I am recommending Hannah's product to all my kombucha lovin' friends and family. I don't know hardly anyone who has even heard of kombucha, let alone makes it, and my friends think I'm a little goofy to have started this. But I love my daily glass. I did several batches w/ mixed success, some great, some undrinkable. The continuous brewing system has changed all the inconsistency, and it has become so easy to do--no more gearing up for a big afternoon project, and every glass is tasty! I was already familiar with kombucha brewing, but was intrigued by the continuous brewing technique. I'm all for simplifying my workload, so I decided to gift a continuous brewer to myself for Christmas this year. I'm so happy I ordered! It's SO easy to decant quarts of kombucha on demand and keep the brew going by simply topping off with sweet tea every so often. This system is a huge timesaver! I agree with other reviews that the heating system is a must. Even in San Antonio, we get a bit too chilly in the winter to brew a proper batch of kombucha. The heater has made all the difference. Wonderful, wonderful products!! I am embarrased to say that I ordered and then let this sit in the corner for 2 months as I was afraid of it. I was busy to and just didn't have time, but when I did open it up I felt silly as it was really easy to do. The videos helped a lot and I knew what to expect. In another month I had my system down - 1-2 bottles a day, refill once a week - so now I've got a rhythm. Love my glass in the morning! This was easy for me to figure out once I got the box to my house and opened it up. There was no problem with the set up, it took me 2 or 3 times through before I got the hang of my own flavors but now I'm a pro and love the blueberry I make the best. So much better than the stuff from the store. And so cheap, that's what I love the most. Thanks Hannah!! I've never brewed Kombucha..been buying at stores for a year and decided to try the continuous brew method. Received my package..including everything needed...and this brewer makes it SUPER EASY! All the directions are included..it's dummy proof:) Thanks Hannah! With continuous brew you don't have to move the scoby at all, just draw off what you want from the spigot and then pour some sweet tea in the top. I just that easy! I brew every 10-14 days by filling 3-32oz bottles topped off with a little fruit juice, refrigerate the bottles and then I always have KT on hand. That follows the 12-cup CB recipe closely and allows the scoby to grow. (I use a 12-cup basic electric coffee brewer for the initial tea brew mix.) In 4-5 months, cleaning the vessel and spigot will be apparent as the scoby will be elephant sized, yield is smaller and the spigot begins to clog up with "stuff". The spigot really has to be thoroughly cleaned - I carefully used toothpicks and thin tweezers. It took a couple times before I shed intimidation and my personal procedure evolved, but now its a walk in the park. I drink a big glass every day as part of my morning elixir. I love it and the $ savings is tremendous! I love this continuous kombucha brewer. It is beyond awesome. All you have to do is make the tea and add it to the container and decant from the spigot and repeat. I don't think it can get any easier. Also everyone loves my kombucha better than the store bought kind. They are bringing their containers over and I flavor it for them. I think it also taste good because of Hannah's tea blend. I haven't tried it with other teas and not sure if I want to. You definitely won't regret buying this! Continuous Brewing is the easiest way to make Kombucha tea. Is that the optimum health benefit. There is no need to do weekly cleaning,no need to worry about the Kombucha mashroom ,and mold is far less likely to form. And is importand---Brewing temperature!! I very recomend Hannah's HEATING SYSTEM WITH DIMMER.Its very helpful! !I'm happy with this product.Thank you Hannah!